The Gospel Music of Elvis Presley! return to his roots in Gospel Music. 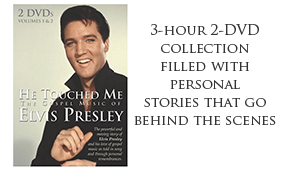 Long before he was crowned the King of Rock 'n' Roll, Elvis Presley was one of gospel music's biggest fans. 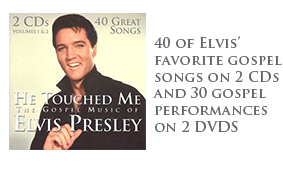 This 2 CD collection truly showcases the gospel music that touched Elvis' heart and features 40 of Elvis' best known and best loved gospel recordings. This 3-hour collection, filled with personal stories by those who knew him well, goes behind the scenes of Elvis’ career. Discover how Elvis was dramatically influenced by two of southern gospel music’s premiere quartets, the Statesmen and the Blackwood Brothers. Learn the controversy surrounding this performance of "Peace In The Valley" on the Ed Sullivan Show and hear the surprising story behind the recording of his signature hymn, "How Great Thou Art" and more! 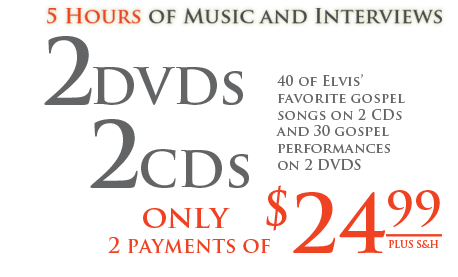 2 CD & 2 DVD OFFER DETAILS: Two payments of $24.99 plus $5.95 shipping and handling. Expedited Delivery available (Continental U.S. customers only) for an additional $9.95 via DHL (about four business days delivery after order is processed). Order processing can take up to one day or two days on the weekend and holidays. Canada Delivery ($10.00 added to S&H) Regular shipping only: Allow two to three weeks delivery via International First Class mail. Add state/local sales tax for deliveries to PA and CO.